Although efforts to fight illegal fishing around the world have improved markedly in recent years, 50 metric tons of fish are still stolen from the ocean every hour, costing the global economy over $20 billion each year. Illegal fishing vessels have also been linked to numerous other maritime crimes and even conflict on shore. For developing nations, the issue is especially challenging because the high cost of surveillance and enforcement in the maritime domain increases their vulnerability to illegal fishing and associated maritime crimes. 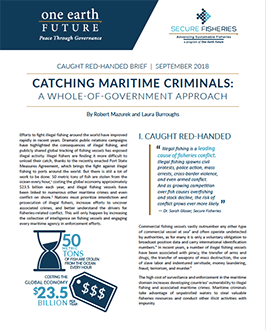 Catching Maritime Criminals: A Whole-of-Government Approach explores how greater interagency coordination can solve a misalignment of mandates among government agencies. Such an approach has been a priority of the 2018 Caught Red-Handed Workshops hosted by Secure Fisheries, the United Nations Office on Drugs and Crime, and U.S. Naval Forces Africa. The Caught Red-Handed workshops were conducted in eleven Indian Ocean countries to maximize participation from local maritime agencies. This brief is the first in a series of papers synthesizing ideas from workshop participants about ways forward in combating illegal fishing.